Despite being careful and doing the necessary research, MMOData.net cannot guarantee the validity of the information found here as it is based on various sources which could be incomplete, inaccurate or otherwise unreliable. Furthermore, all estimates are the opinion of MMOData.net and should be treated as such. Well I have some good but mostly bad news for anyone who liked and followed MMOData.net. v4.1 will be the final version of MMOData.net, and MMOData.net will close down on June 2014. That's right I am closing shop. The biggest reason is that it is getting increasingly difficult to get any useful numbers. Also many of the subscription based MMORPG's went free to play, and their companies tend to not give out useful active accounts numbers. As for the only growing subscription based MMORPG left, EVE Online, I no longer receive subscription numbers. CCP no longer responds to my requests. It is a shame really, I doubt that their numbers are declining, but I lost a bit of confidence in CCP, I hope they will give out useful numbers to the public on a consistent basis. A bit of better news for some of you, because I am closing down the site in 6 months, I will make the complete excel of the MMOData charts available for download. This includes the exact datapoints and their sources or estimate information. 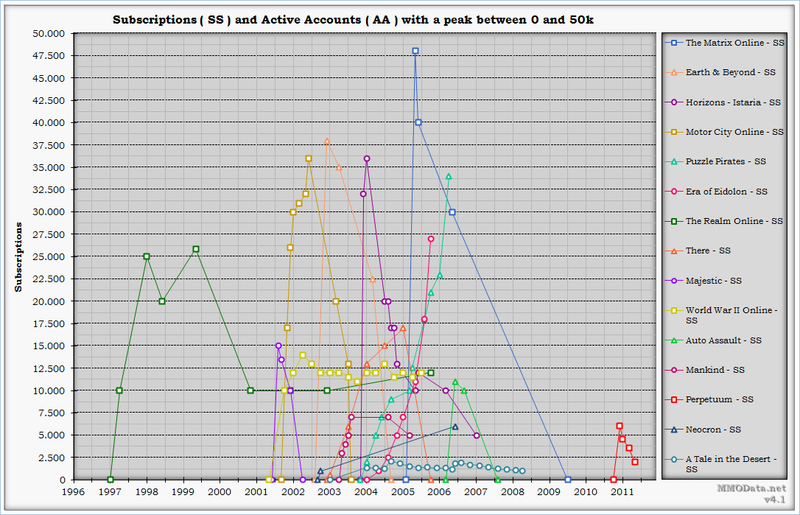 Well that's it, I hope most of you enjoyed the MMOData charts, and perhaps someone will pick up where I left off. MMOData Charts version 4.1 is Live ! - Added World of Warcraft Sub datapoint. - Added Second Life PCU datapoint. - Removed questionable Runescape Sub datapoints. - Added closure date of Warhammer Online. - Corrected closure date of Shadowbane. - Made source en estimate notes better understandable and more structured. - Cleaned up obsolete data. - Right click on the link of the chart with your mouse and open it in a new window or in a new tab. - Refresh/Reload ( F5 ) the page. - Now you should see the correct version number 4.1 in the bottom right corner of the chart. - Once you have reloaded 1 chart, all the others should be updated as well. It took a long time, but here I am back again, presenting you v4.0 of the MMOData.net charts. While this version has a reasonable amount of additions and changes, I expect following versions to have quite a bit less. It is becoming increasingly difficult to get any subscription numbers. Not in the least, because subscription based MMORPG’s are the exception these days. Most of them go free to play. I definatly do not like this evolution, because I am a gamer who prefers fair competition, and therefore prefer a level playing field. Still, this is the direction the genre is heading for a couple of years now. That does not mean there are no options for the true gamers amongst us. There is EVE Online, Ryzom, Ultima Online and a few more. Talking about EVE Online, that is still the example of how to do things in the post - WoW era. While CCP thought they were becoming the dinosaur of the industry, and therefore had to implement a cash shop with micro transactions. They realized their mistakes in time ( after their customers reminded them where their loyalty must lie Riots-in-eve-against-microtransactions ). And turned around and got back on track making EVE Online a better game. CCP is being rewarded now, with a PCU ( peak concurrent users ) of over 65.000 and over 500.000 monthly playing subscribers and a continued growth every year since release, now more than 10 years ago. At this moment EVE Online is the second biggest subscription based MMORPG in the west, and the only subscription based MMORPG that is still growing in the west and probably in the world. If you make a game for gamers, with good features, it will sell and people will pay a monthly fee. 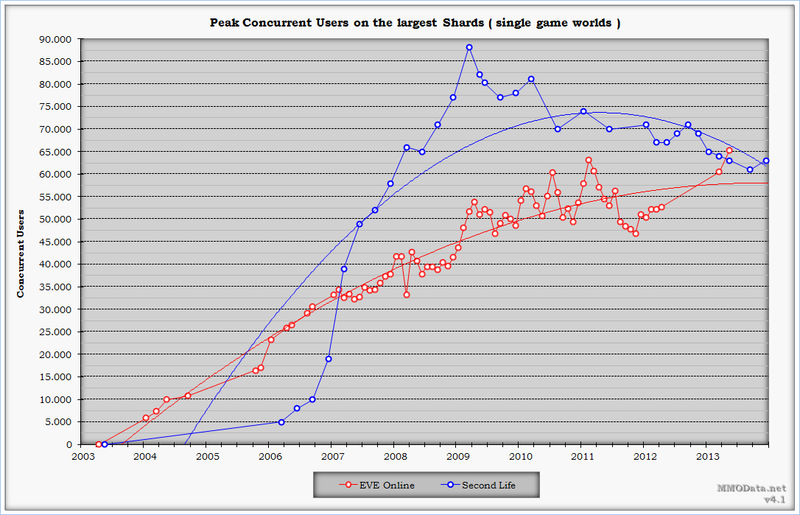 The new PCU for EVE also means it is now the MMORPG with largest shard ( single game world ) in the world, passing Second Life which has now a PCU of around 63.000 players. It will be still a while before the absolute record will be broken tho ( 88.000 PCU in Second Life a few years ago ). Then some notes about requests I received, following MMORPG’s have my interest, but I have no reliable data for them and can't add them to the charts : Tera, The Secret World, and many more. So that's about it for now. If there is something new, you will be notified via twitter ( or you can regularly check the site :p ). MMOData Charts version 4.0 is Live ! 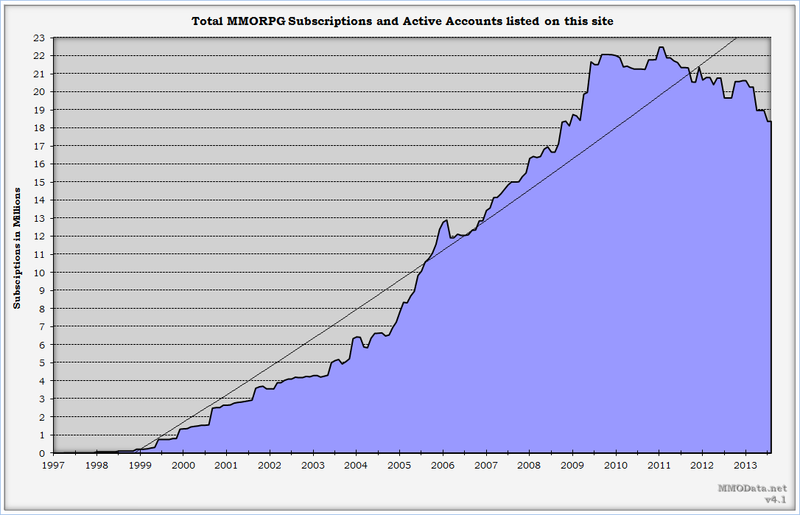 - Added subscription datapoints for EVE, SWTOR, WoW, Runescape. 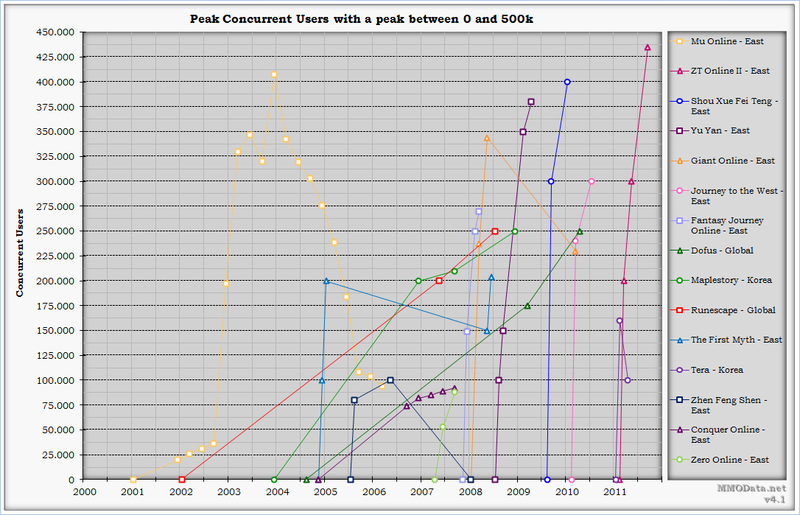 - Added PCU datapoints for EVE Online and Second Life. - Updated subscription datapoints for Runescape. - Revised Aion and WAR subscription datapoints. 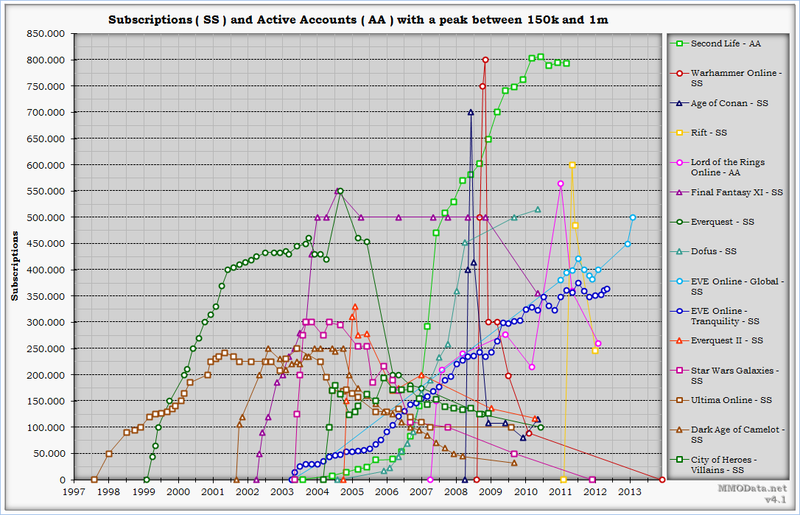 - Expanded charts to December 2013. - Added new Hit counter. - Added Follow by Email. - Added Twitter follow link. - Disabled comments on all pages except News items, for version feedback you will be limited to the version thoughts and comments, this to centralize the feedback and discussion. There will be a thoughts and comments post for each version. - Added mmorpg statistics links. WoW, Aion, SWTOR, EVE, LOTRO, STO, Rift, Runescape. - Expanded sheets and formulas to December 2013 where applicable. So that's why I decided to go ahead and work on v4.0 which I will release in the near future. Well I haven't been able to work on v4.0 or MMOData.net as a whole for a long time now. Life happend. Still I will be reviving the site. Thinking of perhaps making it a community effort somehow. I just got the Q4 quarterly report from EA, and they report 1,3m subs, so I will add this. My latest estimate of 1,41m subs was pretty generous, however I always try to be conservative in my estimates, whether they are downward or upward. What it does show me is that the Xfire numbers are a good indication to base estimates off, purely based on Xfire I would have estimated 1,2m. CCP has send me new EVE numbers, they look good, 361k subs, so they can celebrate their 9th anniversary knowing they are back on the rise. I also added various other datapoints and some improvements to the site, like a twitter follow link. Version 3.8 is only a small update, mainly to add the revised datapoint for Star Wars The Old Republic. I will also talk about Runescape and Second Life, which I didn't mention in my v3.7 thoughts and comments. Star Wars, this is an area that I think has got a lot of people anxious. I've heard from investors today saying that we must have 800,000 subscribers. I heard 600,000 yesterday. So what I think a lot of people have misunderstood is we said we had 1.7 million subscribers on the last call, which was about a month ago. What that was about was the fact that only about – just about half that number had triggered through their 30-day point and become active subscribers, our definition of recurring subscribers. We had about half that total still in the 30-day trial period, but they're subscribers because that first month is including with a package good. What I said a month ago was, just over half. I can now confirm for you today that the vast majority of the 1.7 is now triggered through that point and they're recurring subscribers. I am not giving you my fiscal 2013 guidance, but it is very clear on the surface that some of the craziness that was out there in terms of misunderstanding [ph] this is that I can (10:04) clear up today. It's a very strong entry. We still have a lot of future in front of us. We're two months into the launch, a lot more to go, but 1.7 million, vast majority now, are recurring subscribers. Let me offer some metrics on purchase and subscription that will help you understand thisbusiness. As John stated, we have sold through two million units of the game since December. We currently have a little over 1.7 million active subscribers. The rest have either not started playing yet or have opted out. So the vast majority of the 1,7m resubscribed, now we have to determine what that vast majority is :p, 80%, 90% maybe? If I lay this info next to the Xfire numbers and server load I can come up with a pretty close estimate, and that is what I did in v3.8, where the number is revised upwards. After the initial rush, there was a steep decline in activity, but overall SWTOR manages to keep a sizable chunk of players subscribed. I have to conclude that SWTOR is a bit more stable than I initially estimated and many players keep paying while not playing or playing a lot less. I will keep a close eye on the game, there is still a large untapped potential in Asia, where they were off to a reasonable start in the Asia pacific region with 3 heavy loaded servers. Lastly, I consider the game stabilized now, if the server loads and Xfire metrics drop even more, and no new official numbers are released, the charts will reflect the decline, I will wait until April before making any attempts on a new estimate. First of all with the migration from Runescape Classic to Runescape 2 there may have been some players lost, my listing does not differentiate between the two. Nowadays Runescape 2 is just called Runescape and Runescape Classis is pretty much closed down. Secondly, and more important, the war against bots, macroers and other cheaters increased to unbelievable heights. 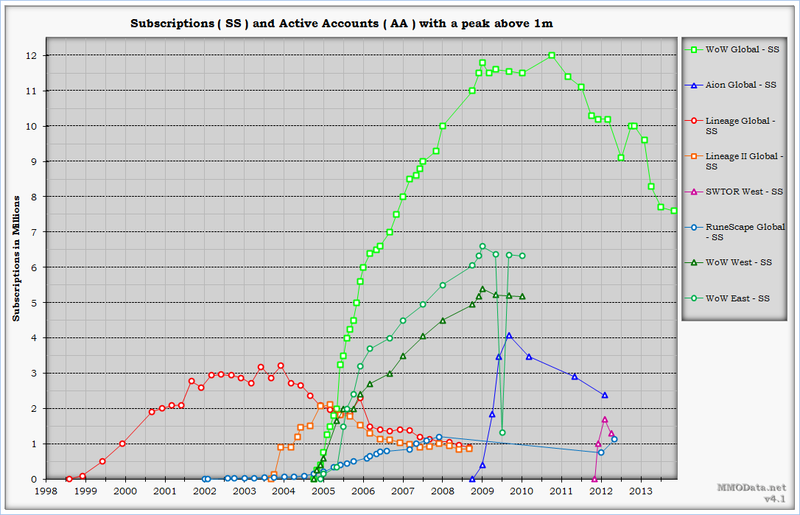 In 2009 Thousands got banned, but that was peanuts compared to the 9,2 million banned accounts in 2011. 9,2 million, I think that must be the largest anti cheater operation in history. I applaud Jagex for fighting the good fight. Well they did it, they stopped giving out their quarterly reports. Now it is not that big of a deal anymore since they basically stripped all the useful numbers out of the report over the years. Tateru Nino has a good article on it here. IMHO Linden Labs and Second Life are not doing great, otherwise they would keep publishing the reports. But the decline did not start today, as was already apparent by their stagnating numbers tipping into a decline. I do hope the PCU numbers will stay published, so we still have some kind of an idea how the game ( or metaverse ) is doing. Added all the relevant quotes on SWTOR from the 2012 Wedbush Conference, in addition to the one I already posted. MMOData Charts version 3.8 is Live ! - Revised Subscription datapoint from SWTOR March. - Added Subscription datapoint for Runescape. - Added PCU datapoint for Second Life. - Fixed several spelling errors. - Expanded the MMORPG Glossary. - Added various sources and information as notes in the dataset. - Made CAS sheet and CAS Derivations consistent again with Subs sheet. - Fixed double listing of EVE regarding to Checks and Sums and Genre market share. With v3.7 I revised some MMORPG's, and retracted some datapoints. I had to retract the last 2 datapoints from WoW East and WoW West as it became clear my estimates were based old information in one case and unreliable information in the other. Furthermore, because the WoW East and WoW West are less reliable than WoW Global, even with the last 2 retractions, I made a separate rating for WoW East and WoW West and downgraded their rating to B.
I realize that I must revise the datapoints more carefully before publishing them. I haven't had to do many retractions in the past, and I will do my best to avoid it in the future. That being said, v3.7 became more than just a revision. I was able to add 2 new Asian MMORPG's, Wen Dao and Journey to the West, because I found a second datapoint for each of them. I was able to add many new datapoints for EVE, including subscriptions, trials and even Chinese subscriptions. For SWTOR and STO there are is also a new datapoint, they are estimates and you can check the comments on the V3.7 version notes to get an idea on how I came there. Because STO went F2P I changed it from SS to AA. I fixed some issues and cosmetic stuff and last but not least added vertical gridlines to easier detect misalignment problems, add this to the improved checks and sums ( internal only )from v3.6 and nothing can go wrong anymore ( I wish :p ). I received more datapoints from CCP, they truly are the most trustworthy source in the industry. They kept providing me with datapoints when EVE Online was in the decline. But this time they have better news. 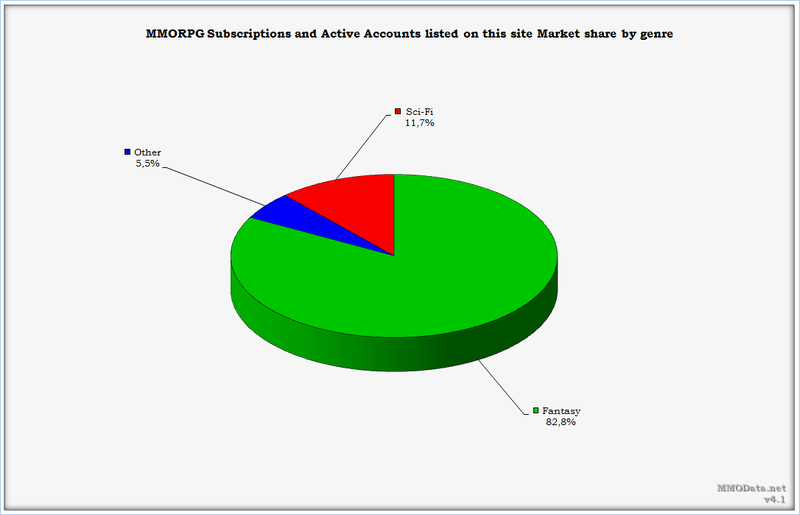 Their subscriptions have gotten back up to 352,5k in March 2012 from a lowpoint of 340k in December 2012. They had a little dip in between with the release of SWTOR, but as I expected, they quickly recovered, and I believe the recovery may even become a new high in the next few months. It all depends of course how they will handle EVE Online, and if they will continue to do it right. If they keep improving the spaceship game as they are doing since the Incarna debacle and improve Incarna sandbox style instead of with microtransactions I think they have large potential. I think they realised by now they are not the dinosaur of the industry, even if they get rid of microtransactions, but they are the turtle of the industry, slowly moving forward but outliving all others. I still have quite a bit of reservations on the implementation of Dust, but we will tackle that when we get there. I have also added EVE Online Global and China AA ( Active Accounts ), this includes the Global server Tranquility, the China server Serenity and the trial accounts. This way you get an idea of how many people are playing EVE Online around the globe, but by keeping the EVE Online Global SS ( Subscriptions ) listed separatly, we still have a view on the health of EVE Online on the main Tranquility server. 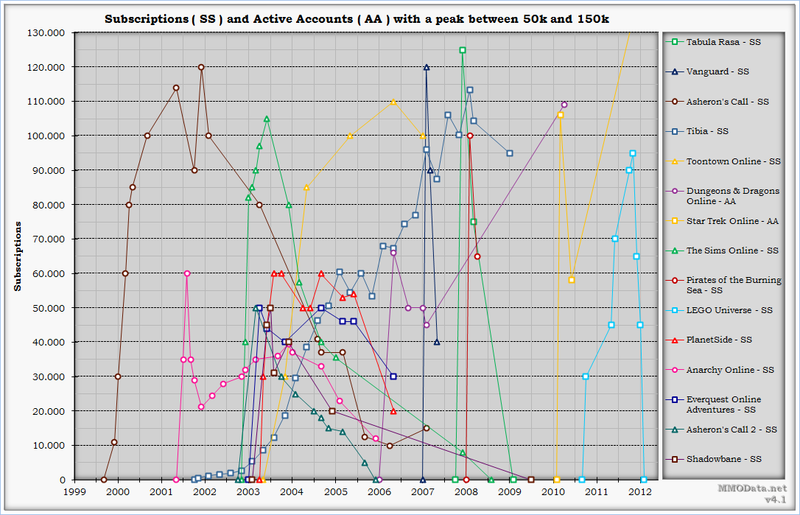 As always, SS is more important than AA here at MMOData.net, but having them both is even better. It is clear their active players are dropping quite a bit, and this is without a doubt translated into their subscription number. My opinion is that SWTOR has a good base game with enough quality content for a newly released game and at the same time it was released quite polished. The problem is that you burn thru the content too fast because it is just too easy, couple this with a light endgame and a thin social fabric and players reach the point of leaving the game rather sooner than later. To elaborate on this further, when you level out of an area before you have done all the content, you either have to skip it, or fight green/gray mobs. If you at the same time want to do all the flashpoints and space missions a few times, then you are definitely fighting gray mobs and there is no longer any challenge. So I bet most of the players that stopped playing just skipped the content and went to the endgame pretty fast. Too bad that the endgame is quite light, which is understandable for a newly released MMORPG, but when the MMORPG is so easy it becomes a serious handicap. Add to this that the social fabric is quite thin because of the heavy use of instancing, quick travel, light guild features, redundancy of crafting and so on, and it becomes clear that there is little to keep the players from leaving. At this rate I don't see EA Bioware putting out enough content to keep the players satisfied, they just can't keep up. It is a mystery to me why they made the content so easy, give out a good chunk less XP and you would have a different situation. I mean the content is there, why force players to skip it? The way I see it is that you should be able to do all of the regular content and then a combination of flashpoints, bonus series and space missions before leveling out of an area. Anyone who provides me with useful numbers or information that allows me to make a good estimate or rectify mistakes, as well as developers or publishers that provide me directly with datapoints can become a contributor. As a contributor your name or handle will be listed on the front page and you will receive the latest version of the full data set for which you contributed.